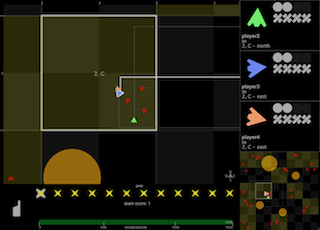 The TeC Game, a zero-fidelity simulation, in action. Teaching team coordination and communication skills is difficult, but critical in organizations. The Team Coordination Games Project, or TeC, designs games from a grounding in practice to teach and enhance these skills. 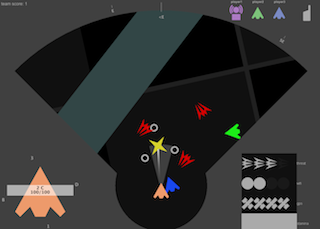 We investigate real-life team coordination practices and integrate results into game designs. Participants play team games that require them to coordinate and communicate with one another to succeed. Night burn training at ESTI, the basis of TeC. Seekers cooperate to collect a goal while under threat, like firefighters. The coordinator observes and communicates, like an incident commander. We are deploying TeC at TEEX Disaster Preparedness and Response's Disaster City, an urban search and rescue training ground that educates 10's of thousands of responders each year. DPR develops state-of-the-art education for our nation's responders and is home to the elite Texas Task Force 1. Educational facilities currently include collapsible buildings, a train wreck, rubble piles, and a coordination center simulator. In upcoming classes, TeC will become a featured educational component. Data suggest the concept of non-mimetic zero-fidelity simulation: an operational environment that requires the use of abstract skills without all of the concrete elements of the mimicked environment. Zero-fidelity simulation allows learners to practice a subset of important skills in a different way that is quick and easy to develop. Creating games around such simulations adds engagement and competition, encouraging students to practice. Based on the data, we distribute information among team members and develop roles for the players. Each team member has different information presented in different ways. All of the information is essential to success, so players communicate, learning to efficiently provide their teammates with the data they need. 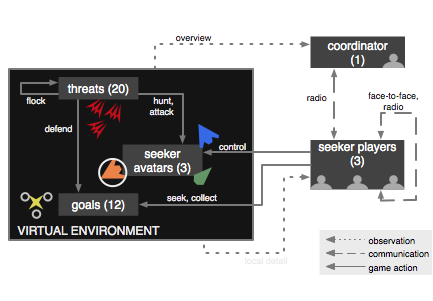 The players either take on the role of seeker or coordinator: seekers act in a virtual environment and observe a local scope, while the coordinator observes a low-detail overview and communicates. The roles are direct analogs to those of firefighter and incident commander, found in the emergency response domain. The basis of the TeC project is grounded in work and teaching practice. Part of the project conducts ethnographic inquiry into the processes of team coordination in fire emergency response at the Emergency Services Training Institute. Investigations at the school have uncovered significant details of how emergency response work is coordinated in practice, and these details are integrated into game designs. Zach Toups, Ph.D.: From student, to research engineer, to professor. The data further suggest that typical simulation/game setups are not suitable for encouraging team coordination. Real-life teams coordinate successfully in spite of, and sometimes because of, being geographically distributed. Team members come together and split up, sharing information face-to-face or using broadcast remote transports (radio). Multiple perspectives and backgrounds are combined dynamically, creating distributed cognition. Desktop setups require participants to be stationary: bound to their machine. Wearable systems, on the other hand, enable participants to roam the environment, naturally coming together and breaking apart. TeC develops location-aware experiences, zero-fidelity simulation games in which participants coordinate and communicate. We have shown the success of our zero-fidelity approach through deploying the stationary game with fire emergency response students, as well as community members. Toups, Z. O., Kerne, A., Hamilton, W. A. The Team Coordination Game: A zero-fidelity simulation abstracted from fire emergency response work practice, ACM Transactions on Computer-Human Interaction (ToCHI) 18, 4, 2011, 37 pages, [DOI:10.1145/2063231.2063237]. Toups, Z. O., Hamilton, W. A., Kerne, A. Zero-fidelity simulation: Engaging team coordination without physical, functional, or psychological re-creation, Proc. MODSIM World 2011. Toups, Z.O., Kerne, A., Hamilton, W. A., Shahzad, N. Zero-Fidelity Simulation of Fire Emergency Response: Improving Team Coordination Learning, Proc ACM SIGCHI 2011, Vancouver, BC, Canada, 7–12 May 2011, 1959–1968, [DOI:10.1145/1978942.1979226]. Toups, Z. O., Kerne, A., Hamilton, W. Game Design Principles for Engaging Cooperative Play: Core Mechanics and Interfaces for Non-Mimetic Simulation of Fire Emergency Response, Proc ACM SIGGRAPH Games 2009, New Orleans, Louisiana, USA, August 3–7, 2009, 71–78, [DOI:10.1145/1581073.1581085]. Toups, Z. O., Kerne, A., Hamilton, W., Blevins, A. Emergent Team Coordination: From Fire Emergency Response Practice to a Non-Mimetic Simulation Game, Proc ACM Group 2009, Sanibel Island, Florida, USA, May 10–13, 2009, 341–350, [DOI:10.1145/1531674.1531725]. Hamilton, W., Toups, Z. O., Kerne, A. Synchronized Communication and Coordinated Views: Qualitative Data Discovery for Team Game User Studies, Ext Abs ACM Computer Human Interaction 2009, Boston, Massachusetts, USA, April 4-9, 2009, in press. Toups, Z. O., Kerne, A., Hamilton, W. Motivating Play through Score, ACM Computer Human Interaction 2009 Workshop on Engagement by Design, Boston, Massachusetts, USA, April 4-9, 2009. Toups, Z. O., Kerne, A., Implicit Coordination in Firefighting Practice: Design Implications for Teaching Fire Emergency Responders, Proc ACM Computer Human Interaction 2007, San Jose, April 2007. Toups, Z. O., Kerne, A., Location-Aware Augmented Reality Gaming for Emergency Response Education: Concepts and Development, Proc ACM Computer Human Interaction 2007 Workshop on Mobile Spatial Interaction, San Jose, April 2007. Toups, Z. O., Graeber, R., Kerne, A., Tassinary, L., Berry, S., Overby, K., Johnson, M., A Design for Using Physiological Signals to Affect Team Game Play, Proc Augmented Cognition International, Oct 2006: San Francisco, In press. Toups, Z. O., Kerne, A., Caruso, D., Devoy, E., Graeber, R., Overby, K., Rogue Signals: A location aware game for studying the social effects of information bottlenecks, Proc Ubicomp Extended Abstracts, Sept 2005: Tokyo.